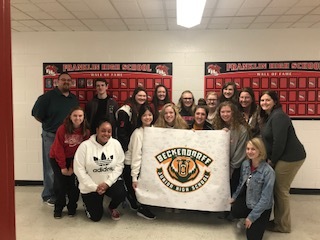 Here is a picture taken with a "Thank You" banner for our FHS Student Government from Beckendorff Junior High near Houston. FHS Student Government raised funds to send to this school in the wake of the massive flooding the area experienced this fall. Vince (in the pic, back row left), is a friend of Mrs. Click's and teaches at the school. He was in town for the Thanksgiving, and stopped by to personally thank the FHS Student Government. I am always so proud of our students, and today is just another example.